Every October 31, Americans celebrate a holiday that is ostensibly about ghosts, teenagers vandalizing their neighbors’ houses, and silly costumes. But everyone knows Halloween’s real purpose is to serve as America’s sugar bacchanalia, a time when it’s acceptable to knock on strangers’ doors and literally demand treats. And, as with all things in life, there are ways to upgrade this ritual (or just improve your own snack drawer). Leave fun-size Snickers to the basics. You deserve something more interesting. 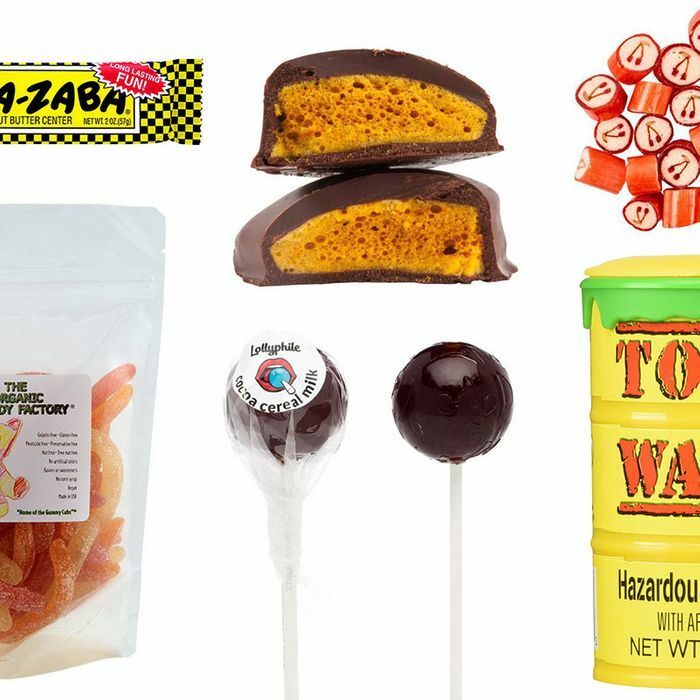 Here are 19 American candies you should get for your Halloween party this year, whether to share with your friends, trick-or-treaters, or actually just eat by yourself. Gummy worms are an American classic and ideal Halloween treat, but they don’t get much attention from newfangled candy-makers. California’s Organic Candy Factory gives them the fancy treatment, using pectin so they’re vegan and natural flavors like grapefruit, sour apple, and tangerine. You’re an adult now, so your gummies should come in adult flavors, right? Los Angeles’s Sugarfina makes them in (nonalcoholic) flavors like Champagne, which come decorated in sprinklelike white nonpareils. A favorite of chocolate freaks nationwide, Fruition coats brown-butter caramel in lightly roasted Hispaniola dark chocolate and gives it an extra oomph with bourbon. Introduce something new to your Halloween roster this year with La Newyorkina, which doesn’t trade in familiar American sweets but traditional Mexican treats. The “sweet and spicy” three-pack includes spicy candied orange peels, pumpkin-seed brittle, and spiced candied pumpkin seeds. If you’ve been looking for sophisticated rock candy, you’re in luck. Tallahassee, Florida–based Raley’s Confectionary makes the classic sweet, in flavors like cherry, with better ingredients and thoughtful designs that make them as fun to ogle as to eat. The Austin company, which recently decided to make a pizza lollipop, takes sugary cocoa cereal and puts it back exactly where it belongs: in the candy aisle, in the form of a lollipop. The Portland, Oregon, company doesn’t shy away from hard candy like other new-school sweets-makers. It hits a nostalgic note with classic butterscotch that’s amped up with vanilla bean and sea salt. Perhaps the country’s top vegan chocolatier, the Baltimore company brings a new twist to the chocolate espresso bean by coating the beans in its creamy, high-cocoa-fat vanilla-bean white couverture. Not easily found in stores on the East Coast, these California candy bars are made of chewy, sticky taffy with equally sticky peanut butter — a seemingly weird combination that actually works. Brooklyn’s Nunu keeps this candy bar simple by creating a single-ingredient filling of airy, crunchy honeycomb candy that’s dunked in dark chocolate. For a limited time, the Ann Arbor favorite’s candy arm produces a hybrid of a Rice Krispies treat and candy bar that’s made with muscovado brown-sugar caramel and encased in mellow milk chocolate. Anyone who grew up on Warheads will dig this cheekily packaged Indianapolis candy, which comes in flavors like watermelon, black cherry, blue raspberry, lemon, and lime. It’s unique in that you get two rounds of sourness, broken up by a (brief) sweet respite. Available in flavors including banana, strawberry, and wild cherry, the vintage taffylike hardy candy — which despite its name was invented in New Jersey — was a favorite thanks to its very long-lasting flavor that would preoccupy your guests while you focused on the punch. Chicken bones likely aren’t the first thing that comes to mind when thinking of themed candy, but the classic oddball sweet, nearly a century old now, is obviously (and morbidly) very fitting for Halloween. Homemade peanut butter is coated in hard candy made of molasses, then coated in toasted coconut. No actual chickens are hurt in the making of this candy. Peanut butter and banana are a natural sandwich pairing, as all kids know, and chocolatier Wild Ophelia does the sensible thing and turns the combo into a milk-chocolate bar. The old-school Colorado confectioner has long been known for its almond toffee, available in both dark and milk chocolate. It doubles down on the almonds, mixing chunks of almonds into the toffee itself and sprinkling crushed almonds onto the outer layer of chocolate. Chocolate bark is a versatile sweet, just the good stuff melted down and topped with whatever you want. This being Vermont, it’s made with maple sugar, which is sprinkled on top and added to a layer of white chocolate. If you love salted caramel but are maybe getting a little tired of it, then consider Vosges’s take: dark-chocolate encasing burnt caramel spiked with pink salt. Winking and nodding at America’s collective realization the sugary cereal is not breakfast food, It’Sugar does the logical thing. It takes the cereal out entirely and just gives you a box full of colored marshmallows.